Sound level inconsistency is one of the most irritating facets of high-tech living. For many years now, systems contractors have had sophisticated DSP tools at their disposal to smooth out these rough audio edges. Not every application, though, needs the full feature set offered by dedicated audio DSP systems. professional DSP onboard. 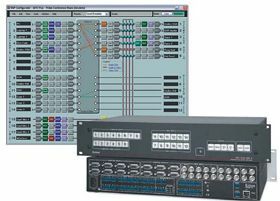 this process began a little over a decade ago, when manufacturers of digital mixing consoles saw the opportunity to build more flexibility into their boards than had been possible using analog technology. In 2007, Yamaha unveiled the NXAMP, a power amplifier that utilized DSP power from its (then) newly acquired partner, the French loudspeaker company Nexo. Most industry watchers believe we will see many more amps with processing built into them, and for good reason. The need for synergy between amplifier and loudspeaker is, of course, one reason why some contractors prefer to specify powered speakers. For these applications, Lab.gruppen has just announced the LM26, a standalone Lake unit that features the same processing technology as the PLM amps.